The essence of conflict is timeless, but the means and methods used continuously evolve. Modern ideas for supply chain surety were codified in 300 BC. The strategic framework expounded by Sun Tzu is not a theoretical construct; it is a coherent, historically validated, and proven strategy for winning in conflict that is as applicable today as it was when it was written over two millennia ago. The organization supporting the construct is what is important: the combinations of people, ideas, and hardware, rather than individual technologies. We herewith present a tested and proven, 2,400-year-old strategy to defend critical supply chains, protect business markets, and safeguard consumers. All references and quotes from the original text of Sun Tzu are taken from the Lionel Giles translation of 1910. Recent translations are arguably more accurate and/or prescriptive, but we defer here to a well-used and accepted classic. On 11 September 2001, long-repressed societal fears became real, and a new phrase entered our nation’s lexicon: homeland security. Previously restricted to governments and think tanks, the term found new meaning and new interpretations as individuals and organizations wrestled with the new landscape of terrorism and its impact. The complacency that followed denies the force of history and, as new threats arise, a real need to conduct a thorough and sober assessment of the status quo accompanies them. Industry is no stranger to terrorist acts. Product tampering, bomb threats, and executive kidnappings are standard lore. But new twists evolve. Following the events of “9/11,” the nation’s oldest and most revered distribution system (the US Postal Service) unwittingly became the messenger of death as letters containing deadly anthrax spores were delivered to targeted individuals. People died, Congress adjourned, and government functions were brought to a stand-still. The US government spent billions of dollars to repair the damage. To date, no indictments have been handed down, and the perpetrator(s) remains free to strike again. The US Federal Bureau of Investigation (FBI) defines terrorism to include “the unlawful use of force and violence against persons or property to intimidate or coerce a government, the civilian population, or any segment thereof, in furtherance of political or social objectives.” This definition includes terrorism carried out by sovereign nations, which is something corporations cannot address. We narrow the scope for corporate applications by considering terrorism to be any hostile, covert act committed by an inimical interest against an individual, interest, or group for political, economic, or social gain and occurring outside the framework of a formally declared war. Today a growing proliferation of counterfeit pharmaceutical products along with increased diversion and product tampering threatens the safety of consumers everywhere. Lest we forget, just over 20 years ago, seven innocent people in Chicago (ranging in age from 12 to 31) lost their lives to a wanton and reprehensible criminal act. Someone (there has been no conviction to date) replaced Tylenol pain-killer with potassium cyanide and left it on a store shelf for innocent purchasers. Tragically, after the unexpected death of their 12-year-old daughter, two more persons from the same family reached for the same poisoned bottle of analgesic to comfort them in their grief — and they died too. National panic set in as the sanctuary of the home suddenly became the source of life-threatening risk. No medicine cabinet went unchecked, and storekeepers emptied their shelves lest they compound an unfathomable tragedy. Fearing for their lives, many people stopped taking life-sustaining drugs as well. Copycat crimes ranging from poisoned milk to adulterated baby formula to sulfuric acid-laced eye drops followed the Tylenol incident. Johnson & Johnson undertook a massive product recall and suffered serious business interruption even though the company was blameless. Government responded by passing new legislation (3), and the pharmaceutical industry responded with tamper-resistant packages — but only after people had died. Pharmaceutical products are critical to individual well-being, which in turn maintains the social, economic, and political stability of societies around the world. No other economic sector is more dependent on consumer confidence. Like food products, drugs are highly vulnerable to deliberate and/or accidental disruption. Manufacturers are responsible for the safety and efficacy of their products throughout the supply chain, from the manufacturing plant to the consumer. Look at the warnings on a simple stepladder, and you’ll see that situation is not restricted to any industry sector alone. Accepting this responsibility is not a simple task, and it requires a critical look at some long-held assumptions about operational activities in complex environments. Modern products increasingly rely on perceived value. Just as software promises to solve problems, pharmaceuticals promise to make people healthy. Both inferences are based on trust and founded on a delivery mode and medium that can be replicated (falsely) with relative ease. Crisis, competition, globalization, innovation, and regulations drive traditional risk. Terrorism, however, is an unusual adversary because its perpetrators are neither competitors nor simple criminals (see the “Defining Terrorism” box). Their motivation can be anything from ideology to greed to vengeance, even something as foolish as 15 minutes of fame (notoriety). In the modern environment, landscapes are changing, and as new trends rise to the forefront they complicate protective behaviors. Disclaimer, probability, predictability, and protestations of innocence have little consequence if risks become a reality and customers suffer injury. Corporations, directors, officers, and executives are increasingly at risk, individually and collectively, for their own (in)actions and those of their subordinates. The supply chain is an Achilles heel that proactive organizations must struggle with, especially those involved in the food and drug industries. Supply chains are vulnerable to internal and external breach as well as physical and nonphysical threats. Individual segments, separated by time and distance, often operate beyond the reach or control of those responsible. The internal workings of a company generally follow standardized procedures and processes written and designed to ensure normative behavior among personnel. Consequently, direct control measures can be used to solve most problems because those problems can be anticipated fairly well if their variables and boundaries are well-defined. The supply chain, however, extends beyond corporate limits of control. 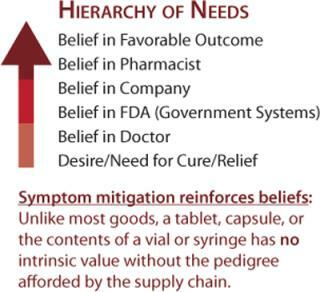 The pharmaceutical industry holds a sacred trust given to it by its customers (as illustrated by Figure 1) to deliver safe and effective products. Consequently it pledges, under the penalty of law, not to put the safety of those products at risk. Logisticians assume responsibility for quality and track manufacturing and transportation; quality and security personnel assume responsibility from manufacturing through transporting products, so they seek to optimize proper achievement of all transactions. The advantage of addressing supply chain risks goes beyond simple protection of the revenue stream and economic profits. Other rewards include reduced risk of product shortages/stock-outs, diminished risk of adverse publicity, limitation of threats to consumer confidence, decreased exposure to product liability claims, and improved control over both material and information flow. The supply chain operates on two levels. Strategically it is a business process, and operationally it is a value stream. The primary value stream is easy to comprehend: Simply look to physical flows of personnel, materials, and information, and assign dollar values to each transaction. As in science, such activities are subject to the laws of physics, chemistry, and mathematics — and there is no shortage of products, tools, and consultants available to help optimize various and individual elements of the stream. Tributary value streams, (e.g., endorsements, alliances, miscellaneous synergies, and so on) can follow pretty much the same metric. The business process aspect of supply chains, however, is far more than can be explained by physical science because of the vagaries of human behavior and countless other intangible factors that contribute. The art (rather than science) of business starts with the need for judgment and includes the impact of moral forces, the influence of chance, the effects of socioeconomic parameters, and other similar factors. Business processes must strategically integrate a company’s internal value steams with its external environment. In the mid-1990s, a major pharmaceutical company marketed a very expensive therapeutic protein in an East Asian country. The drug product was a female hormone agonist for a specific indication, but it had a little-known side effect profile as an actual aphrodisiac for males (although long-term use was dangerous and contraindicated). Throughout the early market period, the company received an unusually high number of complaints from consumers and pharmacists for short fills, and its policy was to replace all such products at no cost to the customers. Corporate management put pressure on the manufacturing plant to better control its filling operations, and those people in turn put pressure on the company’s suppliers to maintain tighter specifications on their bottles and the closures to prevent leaks. Their efforts were successful, but the complaints continued. Other avenues were investigated until finally it was learned that prescribers and knowledgeable distributors were creating the short fills to exploit the aphrodisiac side effect. In this case, physicians and pharmacists — usually valuable allies in the supply chain — were the culprits. The company instituted 100% weight checks and promulgated a new policy with its distributors. They were told of the manufacturing improvements and that product replacement would no longer be automatic but rather only after an investigation of a given supply chain stream was completed. It was a clear warning that supply chain tamperers might be caught by the investigators. And the customer complaints stopped. Military history provides an interesting model for success and failure. Throughout history, generals have always studied (and often fought) the most recent war. Consequently, innovative adversaries usually triumph at the next stage. Consider the French defeat in World War II as the German Blitzkrieg circumvented the Maginot Line by going through Belgium, a neutral nation. At one time, RCA “owned” vacuum-tube technology, much as Kodak “owned” photography. No one could touch them. But that’s no longer the case in either television or imaging. Technological advances or conceptual innovations alone are insufficient to guarantee an outcome, and they are usually short lived compared with social attitudes. Consider the French Revolution, thanks to which people in France suddenly became national citizens rather than royal subjects. Although this did not significantly alter their daily lives, it did profoundly affect their motivation in defense of the state. Similarly, even as a new wave of Islamic fundamentalism is changing the world order, our daily lives seem mostly unaffected. So too with supply chain integrity. The sourcing of raw materials and distribution of goods is vital to a business entity. Business, like war, is about out-performing the competition in the midst of chaos and complexity. The Art of War is an unequivocal indictment of leaders whose only ideas of strategy are to use brute force in frontal assaults and battles of attrition. Anyone who believes that the traditional model of supply chain security — detection, prosecution, judgment, and punishment — will remain valid should stand behind the Maginot Line and turn on their vacuum-tube radio. Industry no longer deals with simple systems that are linear, closed, and predictable. The mechanistic paradigm of the Machine Age is breaking down, and the paradigm of symmetry that has been so studied is now history. Businesses like armies need to understand the nature of competitive conflict and devise appropriate strategies — just as generals use strategic thinking to win wars. Sun Tzu’s foundation for strategy is elegant in its simplicity: Discover and leverage the advantages of your total environment. It is overpowering in its complexity: Skillful action results only from knowing all the details surrounding a situation (its total environment). According to Sun Tzu, wisdom is the root of skillful action. Strategy must evolve from a deep knowledge of both ourselves and our enemy. Success is much more than simply winning. Sun Tzu sought to achieve victory in war, preferably by avoiding direct confrontation and instead causing the enemy’s army to disintegrate before battle. Commercialization of plant gene-insertion technologies at the end of the 20th century threatened to be the seeds of the biotech industry’s destruction almost before it had begun. Under the traditional model, each year farmers would purchase new hybrid seeds because their crops by themselves would not generate a consistently appropriate hybrid for assured growth. When major seed companies introduced pesticide- and disease-resistant seeds using gene-insertion technology, the desired attributes were encoded into every crop seed produced. Consequently, farmers could theoretically have avoided buying from the legitimate supply chain by using their own crop as the seed for each following year. Similarly, anyone purchasing seed could, in effect, have produced competing seed corn for later years. One company, however, predicted such behavior on the part of their future adversaries. They used their technology to develop a “terminator gene” that would preclude the problem before it could develop by preventing crop seed from germinating to new plants. Contrast this with the software industry, which took years to determine that it might preclude unauthorized copying by bonding software to hardware. The strategy devised by Sun Tzu rests on two complementary forces, the internal and the external. Harmony on the inside is one objective; the external objective is to create confusion among the opposition that can be exploited. The enemy commander and forces must become confused. The effectiveness of deception operations, security efforts, and intelligence gathering increases when the opponent is forced to deal with ambiguity. Sun Tzu’s text is not easily assimilated; it requires interpretation. For example, he states that preparedness everywhere means lack everywhere. In other words, a strategy of preparing and reacting, no matter how comforting it may seem, contains inherent vulnerabilities. Merely waiting for adversaries to make mistakes (that is, detection, prosecution, judgment, and punishment) and then forcefully reacting may be an appropriate tactic if circumstances warrant, but it generally fails to lead your opponents where you want them to go. Corporate governance alone cannot mitigate a new threat with policies and efforts that follow traditional approaches and fail to recognize asymmetric threats. Reaction as a strategy may temporarily prevent defeat; but it rarely delivers victory. The passive paradigms of anticipate and respond are anathema to proactive leaders. Fast reactions are important. But remaining in control, staying cool in the heat of battle, and using the other side’s momentum to your own advantage are factors that weigh heavily on the outcome. Risk assessment and judgment must be integral to preparations, but if reaction becomes the objective of strategy, then vision is clouded, proaction is prevented, and initiative will be lost. When dealing with indiscriminate threats, individuals or organizations cannot be identified and proactively eliminated; their plans must be thwarted. The focus should never be on defending, but rather on regaining and using the initiative so that you can coerce opponents into a position where you want them to be. We cannot be arrogant. Our opponents are thinking human beings, and they can also implement the basic strategic tools of surprise, deception, and ambiguity to target centers of gravity (the sources of power and movement upon which management depends). Too often, efforts focus on preparing to defend against the most recent enemy. Such efforts generally work within the limited range of their objective, and although short-term success can be proclaimed, the long-term result may be very different. Again, the Maginot Line provides a clear analogy. France built it to defend against a World War I army — and it was successful for that intent. The attacking forces in 1940 did not breach the defended zone. Instead, they avoided it entirely but still achieved their real objective. Great commanders seek to cloud their opponents’ vision and destroy their will so that a battle (if it must be fought) is quick, decisive, and painless. The concept is to frustrate opponents’ designs so that maneuvers can be applied to further confuse their decision processes, damage their morale, and open up vulnerabilities that can be exploited through surprise, deception, and rapid change. Concurrently, there must be active efforts to probe the opponent(s) and thus unmask weakness while interweaving menace, uncertainty, and mistrust. This strategy eliminates, or at worst greatly reduces, the need for bloody battles. The ideal result is to win without fighting. In today’s business organizations, demotivated opponents are defeated opponents, no matter what weapons remain in their hands. Anyone who has been on a losing team, followed a “lost” leader, or worked for a failing organization can point to a management focus that wasted time, wasted energy, and generated frustration as a consequence. Organizations in that mode succumb to a downward slide into internal conflict. As they fall further behind their competition, successes become rarer and rarer. Efforts to discover problems are more aptly termed “witch-hunts,” and strict adherence to directives and procedures becomes the prime directive of individuals seeking to ride out the storm. People split into camps and start apportioning blame, and the company turns ever more deeply inward. Credit for past successes is reapportioned to those individuals who remain as true historical positive role models are eliminated from the ranks. And the managers never understand what hit them. Sun Tzu emphasized internal harmony to create and exploit external chaos outside. Disharmony can catalyze disaster. In 1999, a large pharmaceutical company was preparing the roll-out and launch of its next blockbuster drug in South America. The company knew from prior history that there would be counterfeits on the market almost immediately. Indeed, they had already seen them. With great publicity and much fanfare, they provided South American physicians with samples and literature in anticipation of the product launch. Finally, the real commercial product was released in slightly different packaging and with slightly different artwork. Counterfeiters were stuck with product that could be readily identified as false. The best way to defeat an enemy is by attacking his strategy. This is not direction to attack early, while the enemy’s plans are being laid, but it is rather a deeper admonition to use unusual methods to seize victory without even battling. Should this prove impossible, Sun Tzu then recommends disrupting an adversary’s alliances, isolating potential enemies from their sources of support or intimidating them through strong alliances of your own. It is advantageous to have on hand a variety of responses that can be applied rapidly to gain sustenance, avoid danger, and diminish an adversary’s capacity for independent action. To shape and adapt to change, you can’t be passive; instead you must take the initiative. Therefore, The Art of War instructs us to analyze our environment and landscape, surmise courses of action, and identify the adversary’s shortcomings. Probe the environment to ascertain the patterns of movement. The objective is to compel our adversaries to reveal their dispositions and, from that information, be able to ascertain our relative positions. The ultimate objective in dispositioning your own forces is to conceal them without exposing their strength and composition. Then the opponent cannot formulate plans against you. Products (and packages) can be designed to incorporate features that make them difficult to copy and facilitate counterfeit detection. Multilayered defenses similar to those used in currency — overt, covert, and reserved — can help to make copying products more difficult. Criminals are focused on their bottom lines as well: They will seek the path of maximum profit with the least resistance, thus avoiding “hardened” supplies and choose “softer” targets instead. Beyond the embedded protections, corporate efforts must look to contract protections, supply chain hardening, distribution control, and careful control of employees. Cooperative efforts and alliances should be sought. And leadership must be unified and deliberate. Sun Tzu was not concerned with the types of hardware in use. He focused on the problem of how to get groups of people to work together harmoniously under conditions of hardship, danger, and the inevitable confusion of conflict. There is no magic bullet or miracle technology (e.g., RFID, holograms, inks, and so on) that everyone can use to defend his or her supply chain. It is the combination of such tools with their human interface that generates their real power. The Art of War begins with political leadership, which provides a direct comparison to today’s corporations. Before envisioning conflict, Sun Tzu explains that leadership should survey and compare five factors: moral law, Heaven, Earth, the commander, and method and discipline. “Moral law” causes people to be in complete accord with their ruler, so they will follow him regardless of their lives and undismayed by danger. “Heaven” signifies night and day, cold and heat, times and seasons. “Earth” comprises distances, great and small, danger and security, open ground and narrow passes, and the chances of life and death. “The commander” stands for the virtues of wisdom, sincerity, benevolence, courage, and strictness. By “method and discipline” are to be understood the marshaling of an army in its proper subdivisions, the graduations of rank among officers, the maintenance of roads by which supplies may reach the army, and the control of military expenditure. These five concepts should be familiar to every general. He who knows them will be victorious; he who knows them not will fail. The operative point is that three of those five — the most significant three because weather changes and along with terrain affects both sides — concern moral, human, and cultural issues. In modern supply chains, weather and terrain express themselves as uncontrollable business conditions. Moral, human, and cultural issues can be controlled internally to influence the external world. This is the dominant theme of Sun Tzu. He believed that the moral strength and intellectual faculty of men were decisive in war and that if these were properly applied, it could be waged with certain success. The final chapter of The Art of War deals with the use of spies. Often what enables individuals to overcome others and achieve extraordinary accomplishment is fore-knowledge. That cannot be bestowed, cannot be had by analogy, and cannot be divined through analysis alone. It must be obtained from people who know the landscape and the environment. Far from an afterthought tacked on at the end of the book, this section on spies may actually be the key learning point of the entire work. Sun Tzu makes that clear in the final passage: “Spies are a most important element in war, because on them depends an army’s ability to move” (7). In the business world, this translates to information. Good sources (“spies”) can include due diligence, business consultants, and experienced personnel. Defense of the supply chain is a conflict that can be won or lost. In the pharmaceutical market sector, a loss can translate to innocent deaths. Specific tools and methodologies exist to defend products and organizations, and their implementation is a function of art as much as of science. Skillful “warriors” strive to first make themselves invincible and then await the moment of their foe’s vincibility. Invincibility depends on yourself, but the enemy’s vulnerability on himself. Herein lies both the inevitable conundrum and the fundamental premise of defending the supply chain. It must be invincible and its enemies must be attacked when they are vulnerable. The most skillful defense eludes discovery by the enemy. A successful company can identify and use technologies, can align its organization and people with its own objectives, and react deliberately and swiftly to exploit its power while leveraging the environment. Success will translate to lessened liability and increased market share. 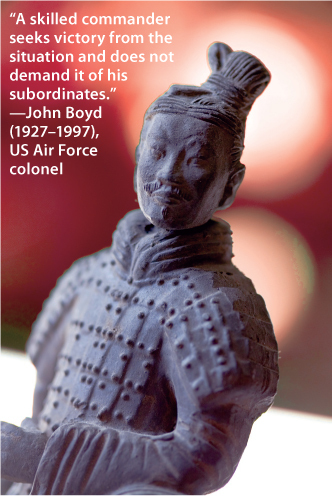 The bad guys will look for easier targets — those who missed the lessons of Sun Tzu. Because new pharmaceutical products must always come from a research base (even if they are acquired through financial means), the most forward-thinking companies continue to quest for new and better products with renewed intensity even after blockbuster compounds have proven themselves. The new class of nonsteroidal antiinflammatory drug (NSAID) provides a good example: The lead compound of its discovering company entered phase 3 trials with two back-up compounds entering phases 1 and 2, different formulations for different uses. Cannibalization of the blockbuster product was used to control the research portion of the supply chain and establish “ownership” of similar avenues of therapy. As a consequence, the product category is available in capsules, tablets, and injectible formulations. Concurrent efforts developed veterinary formulations for dogs and horses and at least two other compounds with therapeutic effects believed to be better still remain for future development. Although initial product revenue is limited by this strategy, overall company revenue and market dominance are assured. 1.) Tzu, S. 1910.Chapter 1, Passages 1–2 The Art of War. Lionel Giles, translator. 2.) Tzu, S. 1910.Chapter 3, Passage 3 The Art of War. Lionel Giles, translator. 3.) US Public Law 98-127: Federal Anti-Tampering Act 1983. 98th Congress of the United States. 4.) Tzu, S. 1910.Chapter 3, Passage 18 The Art of War. Lionel Giles, translator. 5.) Tzu, S. 1910.Chapter 3, Passage 2 The Art of War. Lionel Giles, translator. 6.) Tzu, S. 1910.Chapter 3, Passage 27 The Art of War. Lionel Giles, translator. 7.) Tzu, S. 1910.Chapter 3, Passage 27 The Art of War. Lionel Giles, translator. 8.) Tzu, S. 1910.Chapter 5, Passage 11 The Art of War. Lionel Giles, translator.